cardigan junkie: Healthy Recipe Linkup! These are really great right out of the oven when they're crispy. However, don't make more than you'll eat because they do not do reheat well the next day. Enjoy! Now, head over to Elleinadspir and check out all the other recipes or add one of your own! These sound really good. Apparently butternut squash fries are pretty good too. I plan to try them out this summer. I must make these. Scratch that. I will make these. This week, for sure. They look delicious! Congratulations of losing 5 lbs!!! YUM! that looks SO good, i love zuchinni! xoxo jcd :: ps im hosting a interior design link up! post about your dream room or decor wishlist and link up at cornflake dreams all week! I love those !! So yummy. Ohhh! I've been meaning to try this! Nice share!! 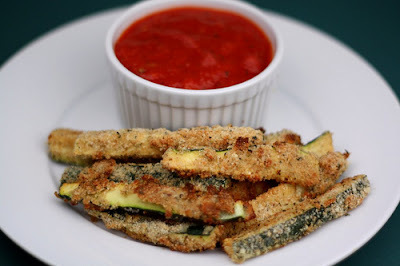 i LOVE zucchini, so i will definitely have to try this recipe! Yum this recipe looks so good. I'll be trying this out.